Peaches tend to do well in central and southern Illinois. Most of the peach cultivars are not winter hardy so they cannot survive cold winter temperatures in northern Illinois. The variety suggested for northern Illinois is called 'Reliance.' The varieties suggested for central Illinois are: Yellow fleshed varieties ('Comanche,' 'Madison,' and 'Reliance'); and White fleshed variety such as 'Belle of Georgia.' The varieties recommended for southern Illinois can be planted in favorable locations in central Illinois. The varieties suggested for southern Illinois include yellow fleshed varieties – 'Harbelle,' 'Redhaven,' 'Comanche,' 'Harken,' 'Golden Jubilee,' 'Madison,' or 'Cresthaven.' 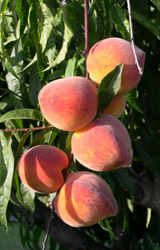 Most peach cultivars are self-fruitful. Plant standard trees or cultivars grafted on St. Julian A dwarfing rootstock. Peaches tend to have vigorous growth so the central part of the tree needs to be kept open. They need more severe pruning as fruit is borne on one year old shoots. Brown rot is a disease that attacks twigs and fruits of stone fruits and peach leaf curl that attack the leaves are some of the common diseases of peaches and they can be controlled by fungicide spray. The other serious disease of peaches is bacterial spot.